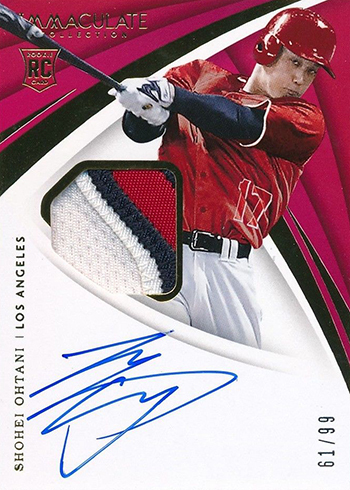 Heading into the 2018 season, there was plenty of attention surrounding the Shohei Ohtani Rookie Card and autograph lineup. He was one of the most hyped players to arrive in the majors in some time. Ohtani also arrived with a large fanbase thanks to his years as a superstar in Japan beforehand. 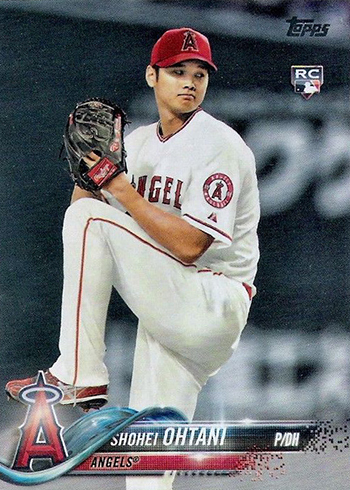 So collectors in Japan were already very familiar with Shohei Ohtani cards. Now it’s time for major league cards. 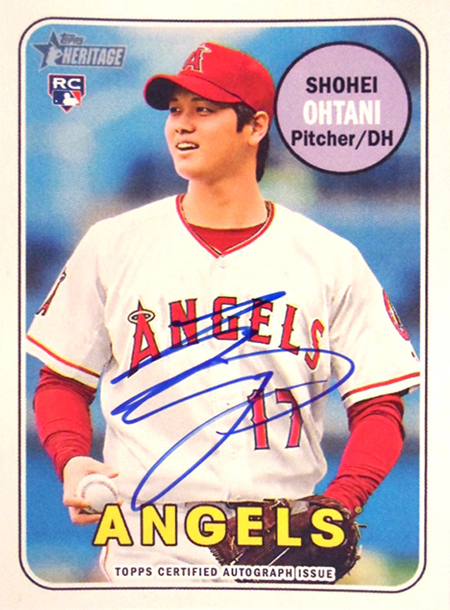 By the time his rookie season with the Los Angeles Angels came to a close, collectors had a lot of Shohei Ohtani Rookie Cards, inserts and autographs to choose from. 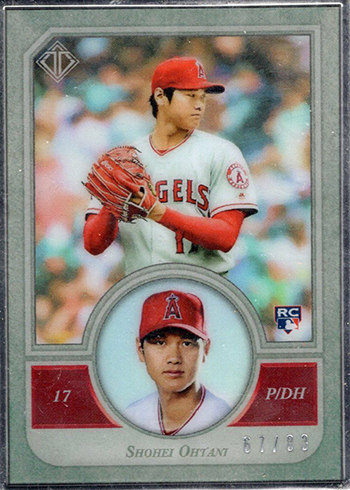 Here is where you will find a detailed Shohei Ohtani Rookie Card breakdown as well as highlights of other cards. The Shohei Ohtani Rookie Cards are listed alphabetically. The ones in this section are limited to those with the ‘RC’ designation in the Beckett Baseball Card Database and Price Guide. Inserts and parallels are not included. The regular Shohei Ohtani Rookie Card in 2018 Bowman Baseball is a fairly straightforward affair. It’s simple, doesn’t draw attention to itself and is readily available. So in the big picture, it’s going to be one of the more affordable choices out there. The parallels bring some color and added scarcity. 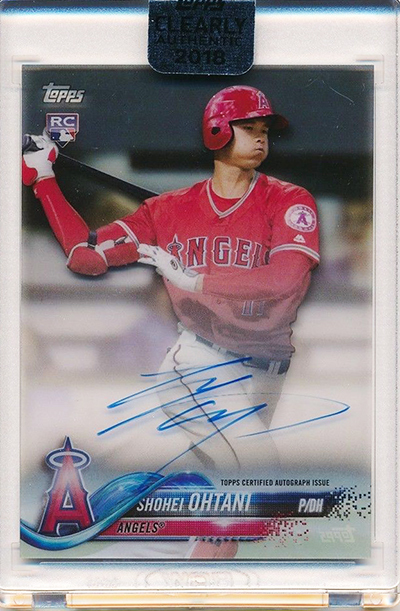 But the big interest in the set comes from the Bowman Chrome Shohei Ohtani autograph that’s found in packs. It’s an insert and not a traditional RC, but that hasn’t stopped it from going for thousands early on and even tens of thousands for some of the rarest Refractors. 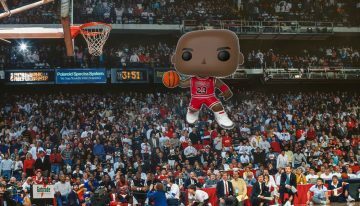 The one-of-one Superfractor Autograph fueled a lot of buzz throughout the hobby and beyond. It was found in June by a California collector. 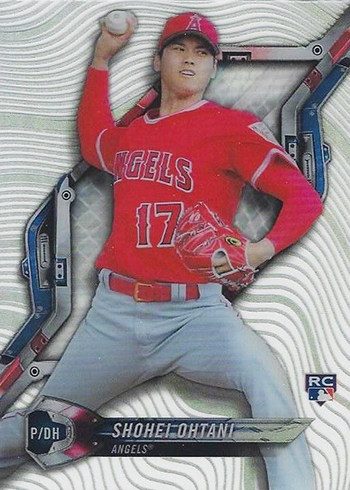 An affordable Shohei Ohtani RC, this one is found in the hobby-only 2018 Bowman Chrome. It has the Chrome shine and a good amount of parallels but the product is more focused on autographs and prospects. So it’s somewhat on the overlooked side. 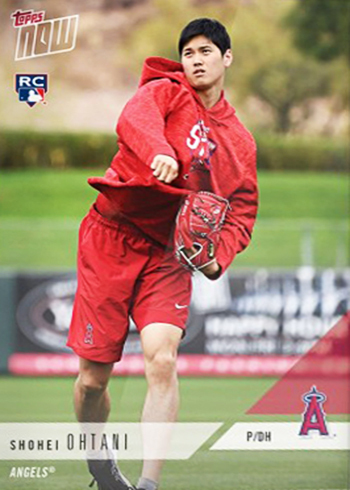 The card also has a variation with Ohtani pictured carrying an equipment bag. 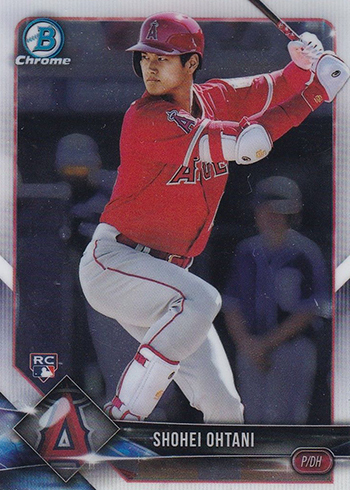 The 2018 Bowman Platinum Shohei Ohtani is one of the Angels star’s wilder looking Rookie Cards. 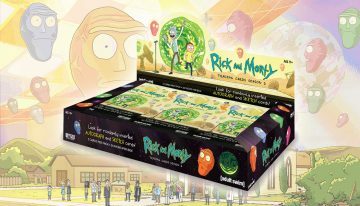 Besides the colorful graphics dancing in the background, the card comes printed on foil. It’s not a scarce card but the product was an exclusive to Walmart. Like many of Ohtani’s 2018 cards, there’s a variation short print where he’s pictured carrying a bag. 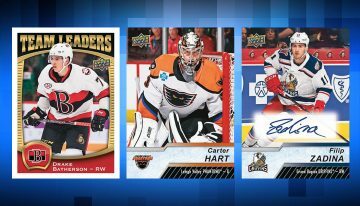 2018 Bowman’s Best closed out the baseball card season. Coming on the heels of Bowman Draft, it’s probably not surprising that Best is somewhat overlooked as many prospectors are moving on to the latest draft picks. But for those who like chromium and the Bowman name, there’s more color and design elements than Bowman Chrome. There’s still a parallel rainbow, too, but it’s not as large. Found in the anthology-style 2018 Panini Chronicles. 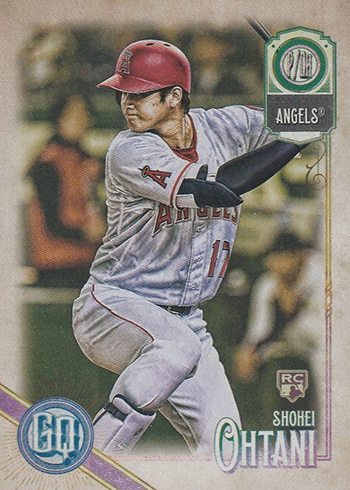 2018 Diamond Kings has a pair of Shohei Ohtani Rookie Cards in the base set, one with him pitching and the other with him batting. Neither is a short print or part of a subset so both get the RC tag and are held on equal footing as far as value goes. Diamond Kings takes an artistic approach with both the images and the canvas-style stock the cards are printed on. In addition to a full slate of parallels, both cards have four different variations in the set. And those have parallels too. You’re not going to pull the 2018 Donruss Shohei Ohtani Rated Rookie from packs you find at the store. That’s because it’s exclusive to wrapper redemption packs. Packs were available in exchange for 24 empty wrappers, the equivalent to a hobby box. So it wasn’t hard, although supplies were somewhat limited. In each pack was three cards, one Ohtani, one Gleyber Torres and one Ronald Acuna. 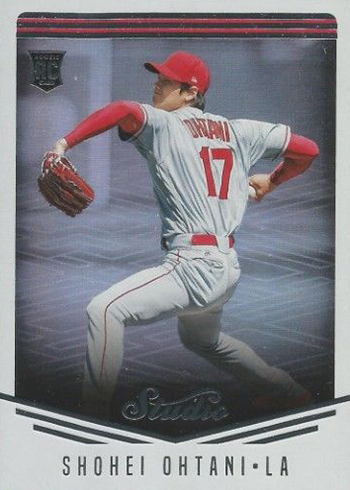 While there are no parallels, a variation is available with Ohtani’s name written in Japanese. 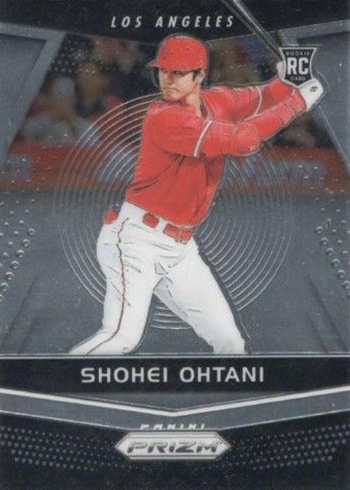 The 2018 Donruss Optic Shohei Ohtani Rookie Card puts an Optichrome spin on the regular Donruss design. It’s a different image and a completely different mix of parallels. There’s also a variation with Ohtani running. 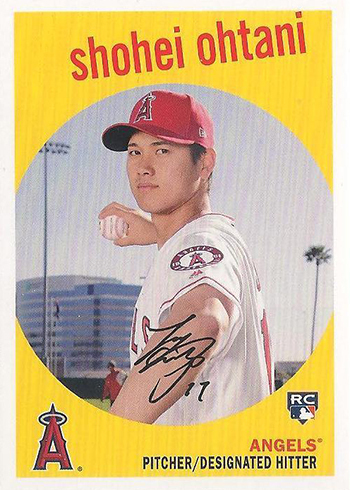 The 2018 Finest Shohei Ohtani Rookie Card isn’t a complicated card. Nor should it be overly expense. But it is shiny. 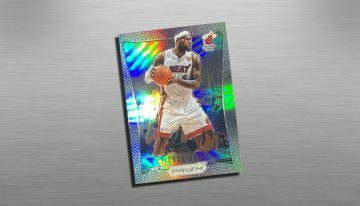 For those who like a little more pop, Finest also comes with a more vibrant design than comparable sets like Bowman Chrome. The chase for his base card is likely to come more with the rarer Refractor parallels. 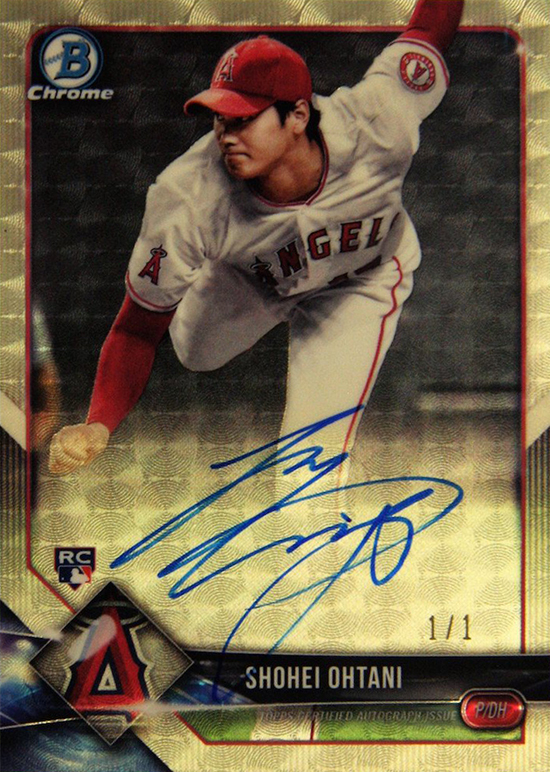 Ohtani also has an autograph — including a Superfractor — in the product that carries a similar design and on-card signature. 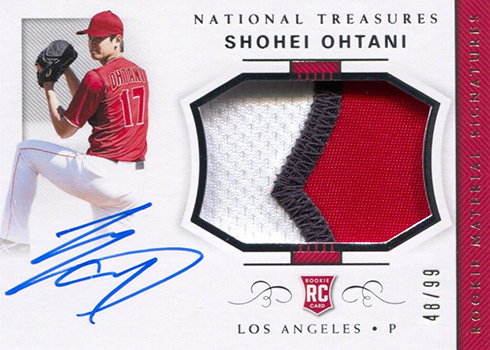 Not quite National Treasures or Dynasty, the 2018 Immaculate Collection Shohei Ohtani still has some impressive attributes like an on-card autograph and patch piece. 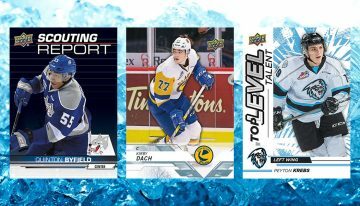 By not being on the same level as some of the ultra-premium sets, that means it’s more affordable as well, which opens it up to a wider range of collectors. Found in 2018 Panini Chronicles. 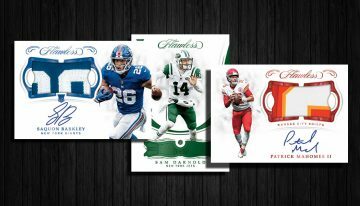 2018 Panini Chronicles is driven by its anthology approach that includes more than a dozen brands all getting mini sets of sorts. But there’s also a Chronicles standalone portion. For Ohtani, it means two different Rookie Cards neither of which is harder to find than the other. The cards take a storytelling approach to its design, bolstering headlines over stats. There’s a reason Flawless comes packaged in a briefcase. 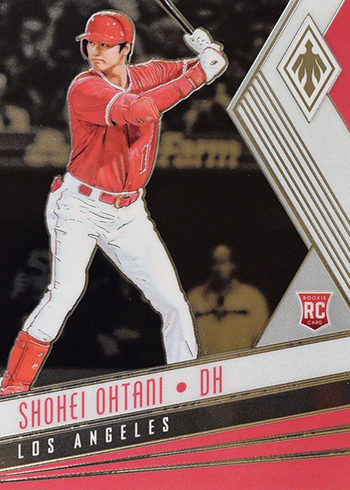 Tipping the high-end scales, the 2018 Panini Flawless Shohei Ohtani Rookie Card might not have an autograph or a patch that takes up the entire front of the card. But it does have a diamond and a tiny print run of just 20 copies. 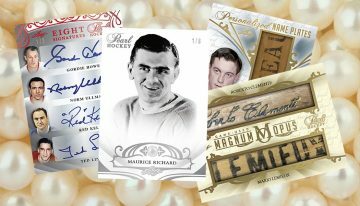 National Treasures is one of Panini’s biggest brands when it comes to super-premium sports cards. 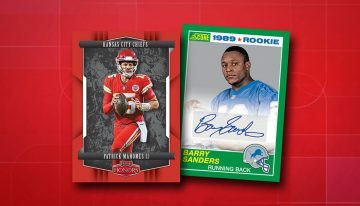 Similar to basketball and football, this often means autographed jumbo patch cards for rookies. The 2018 National Treasures Shohei Ohtani Rookie Card is no different. The signature is on-card and the print run is limited to 99 copies. 2018 Stadium Club focuses on photography. Let’s face it, there’s isn’t a lot that’s action-packed about a microphone, a podium and a press conference. And as far as photo selection goes, it’s similar to what was used for Ohtani’s Opening Day Rookie Card and his debut Topps Now card. 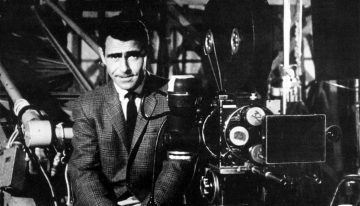 Chances are, when the set entered its production phase, there wasn’t a lot to choose from. 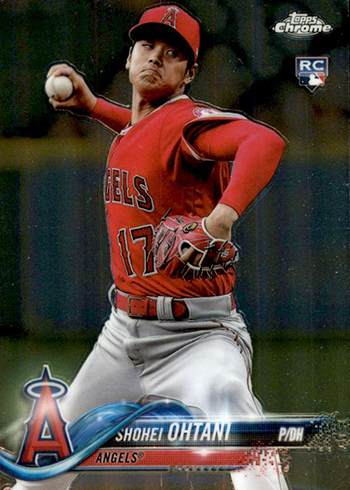 There is a slightly more action-oriented pitching version of the card that’s among Stadium Club’s variations. 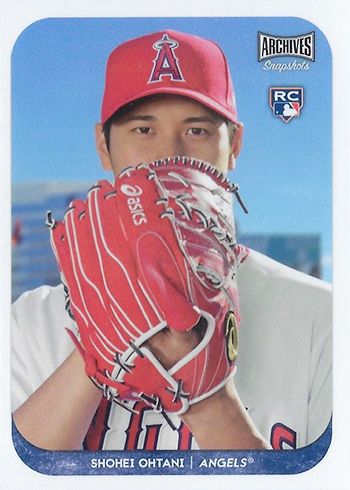 Found in 2018 Topps Series 2 packs, this represents Ohtani’s flagship Rookie Card. It’s not hard to come by and it’s not overly expensive. 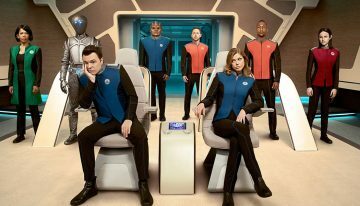 That said, the second series does appear to have a smaller print run than Series 1. 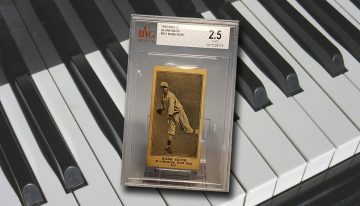 Topps Baseball is the line that a lot of collectors look to, both active and casual in the hobby. There’s history. There’s continuity. Along with the regular version there are a couple of variation short prints. 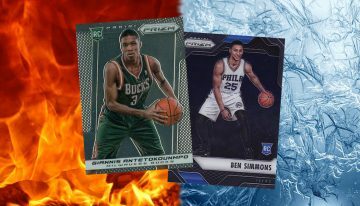 Retail factory sets have yet another version of the card as part of a series of five bonus Rookie Variations. 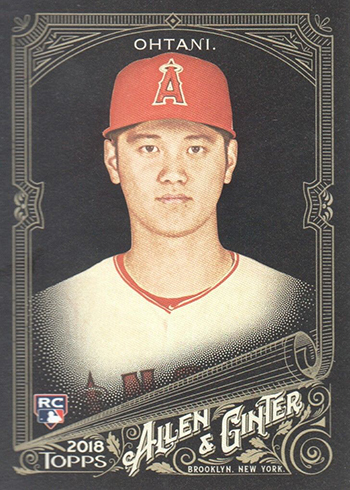 Inspired by the past but not directly riffing off of it, the 2018 Topps Allen & Ginter Shohei Ohtani Rookie Card comes from one of the hobby’s most popular lines. That means it’s readily available and at a reasonable price. Most of its parallels are done as mini cards, a nod to the brand’s original tobacco roots. 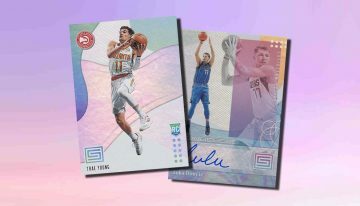 As they’ve done for the past few years, 2018 Allen & Ginter X is the online-only version of the main set. That means the same general design and base set. It also means dark backgrounds that are a big contrast to the original white. This set sold out within a couple of days on the Topps website. 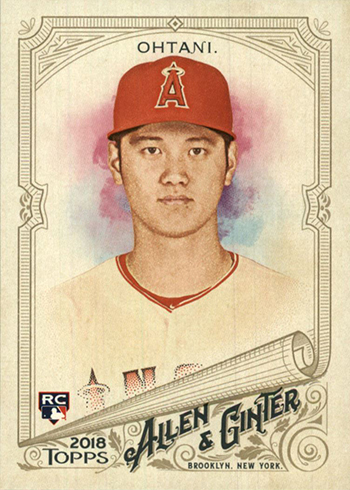 Adopting the 1959 Topps Baseball design, the 2018 Topps Archives Shohei Ohtani Rookie Card taps into the line’s nostalgia. It’s a no-frills card in its most basic version. That said, it has a couple of tricky parallels that don’t jump out right away. 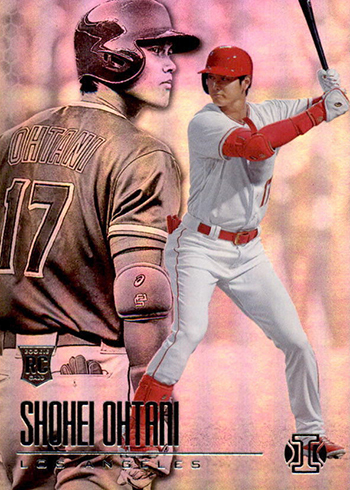 There’s also a variation short print with Ohtani holding a bat. 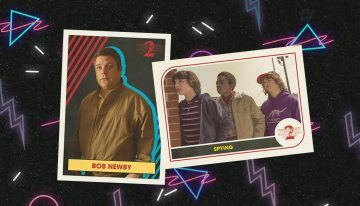 2018 Topps Archives Snapshots is another online-only product released through the Topps website. So it’s not the most common Ohtani RC out there but it’s not all that scarce. 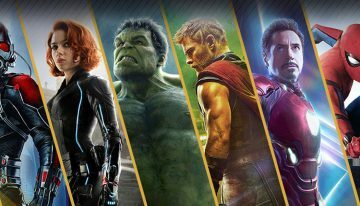 Even with an expected overall lower print run than traditional releases, the checklist is small. 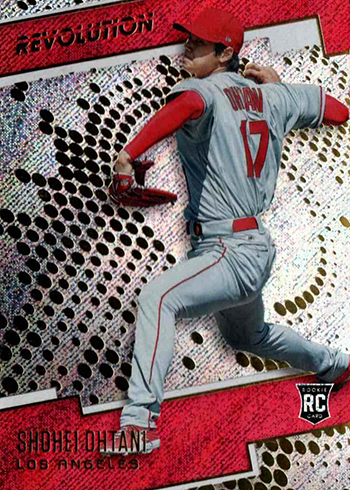 2018 Topps Big League marks the debut for the entry-level brand. That means a lower-than-average price point and wide availability. It also means a card that probably won’t be worth a lot compared to many of Ohtani’s other 2018 releases. 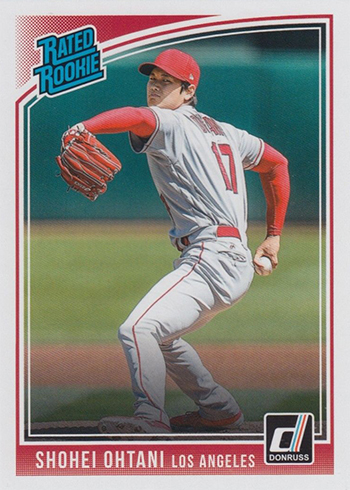 2018 Topps Chrome offers a lot of flash but not a big price tag as far as the Shohei Ohtani Rookie Card portfolio goes. It puts a chromium spin on the flagship release. Refractor parallels are plentiful, bringing in rarer and colorful versions to chase. 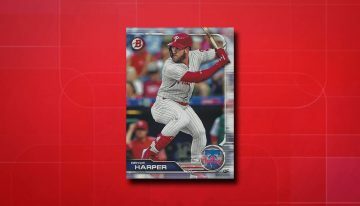 Topps made a couple of key changes to 2018 Chrome Update versus previous year. It was still a Target-exclusive. But rather than coming in a couple of bonus packs inside a blaster with regular Topps Update packs, these ones have only Chrome Update. On top of those were separate fat packs. The result is the perception that there’s a lot more of it that earlier years. 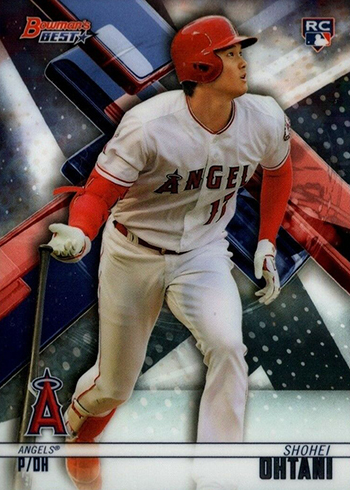 Also, with Ohtani appearing in the main 2018 Topps Chrome set as well, it takes away some of this card’s allure. 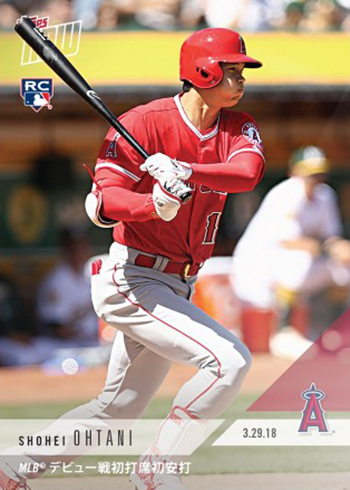 The layout of the 2018 Topps Clearly Authentic Shohei Ohtani Rookie Card looks like a flagship card at first glance. But it’s very different. 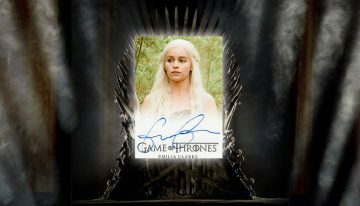 The autograph is the big inclusion, instantly making this a premium RC. Adding to its distinction is the fact that it’s printed on acetate rather than traditional stock. 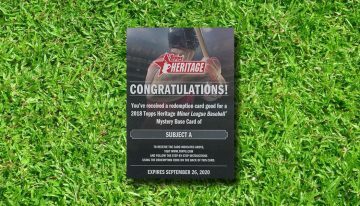 This card was originally inserted in boxes as a redemption. 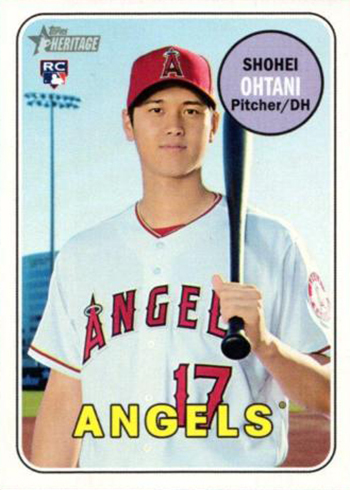 With just 25 copies, this was a tough Shohei Ohtani Rookie Card to begin with. Factor in the fact that 2018 Topps Diamond Icons is one of the most expensive baseball products ever released, it becomes understandable why this card is pricey. The on-card autograph certainly doesn’t hurt, either. Autograph patch cards numbered to 10 or. That’s the distinguishing feature of Topps Dynasty. Ohtani has seven different cards in the set. The layout on all are the same but the image is different. This allows for the extremely low numbers. But even when you combine them all together, there’s only 70 total Rookie Cards for the 2018 AL Rookie of the Year winner in the entire product. The big design elements immediately jump out on this card. And that’s intentional. It’s one of the signatures of the Topps Fire line. Created by graphic designer, Tyson Beck, the boldness makes it stand out. 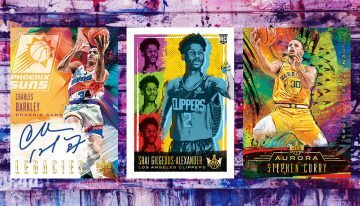 There’s also the fact that 2018 Topps Fire was released as a Target-exclusive. Despite this, it’s a fairly affordable and readily available card on the secondary market. 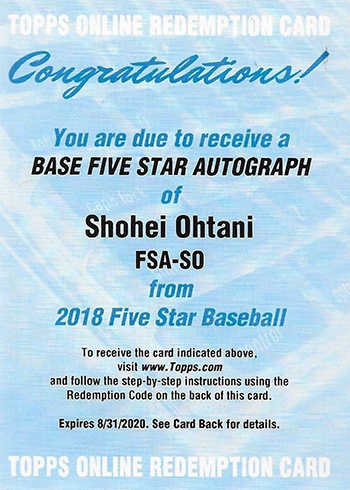 Included in packs as a redemption, the 2018 Topps Five Star Shohei Ohtani Rookie Card is an autograph. Therefore, it’s one of his more high-end cards to carry the RC tag. 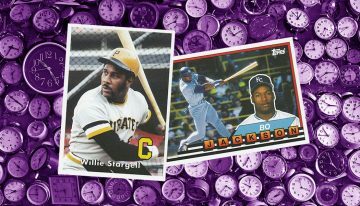 A few years earlier, Five Star was considered the most premium line in the Topps baseball portfolio, but there has been a shift as more premium lines have been introduced. 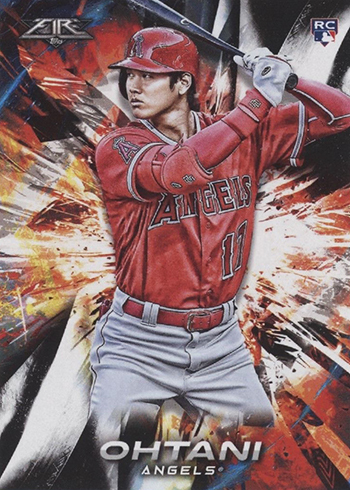 Another Walmart-exclusive, the 2018 Topps Gallery Shohei Ohtani Rookie Card uses art as its inspiration. This does help make it different from a lot of his other cards and distinct. Fairly widely available despite being a store exclusive, it’s not his cheapest Rookie but it’s far from pricey. 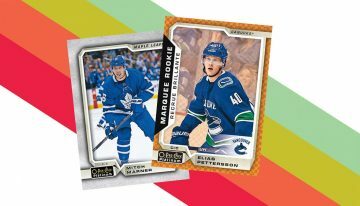 2018 Topps Gold Label takes a tiered approach to its base set. All 100 cards, including Ohtani, have three different versions: Class 1, Class 2 and Class 3. While the designs are similar, the photos are different. So are the rarities. 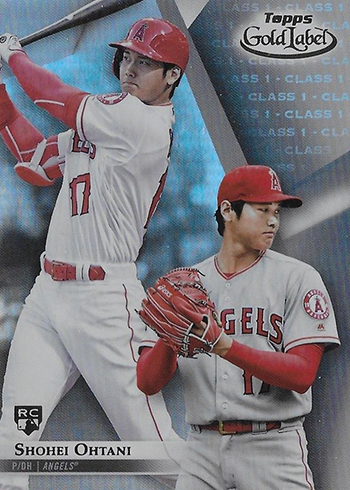 Class 1 is the most common so it’s considered the RC of the set for Ohtani. 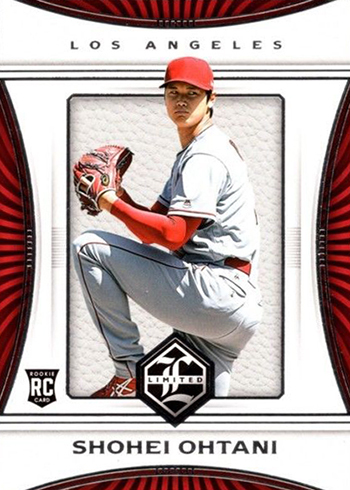 2018 Topps Gypsy Queen Baseball brings the second Shohei Ohtani Rookie Card to the table. It’s got an old-time look about it, albeit with a more modern approach to color. Not a short print, there are plenty out there. When it comes to parallels, there are several. However, some are a little more stealth than others and might require a slightly closer look. 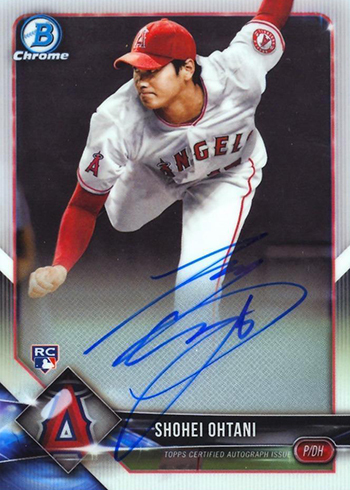 The product also has an Ohtani autograph. Like everything in 2018 Topps Heritage, this card adopts the look and general feel of 1969 Topps. 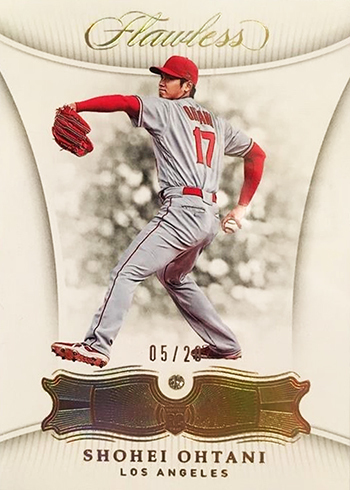 This Shohei Ohtani card is found in 2018 Topps Heritage High Number packs and has several variations in addition to the base version. 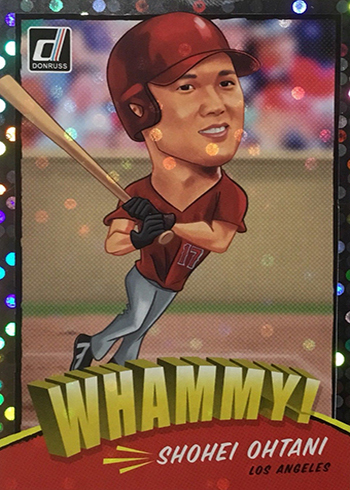 Ohtani also has a card in the earlier Heritage set. However, it’s a variation short print. While it’s worth significantly more, it’s more of an insert and not a traditional Rookie Card. 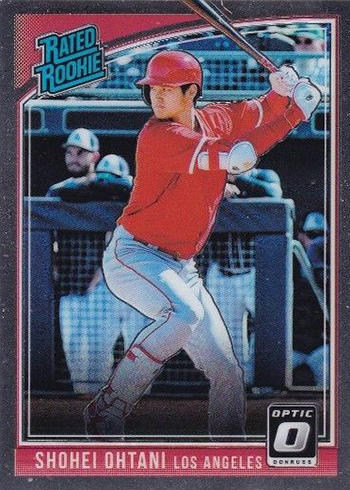 You’re going to be hard-pressed to find a wilder looking Shohei Ohtani Rookie Card than the one found in 2018 Topps High Tek. Printed on acetate with a busy foil background, it not only looks different but it feels different. If you want to go down the rabbit hole, there are several pattern variations that changeup the foil in the backgroun. And then on top of those, there are plenty of more traditional parallels. 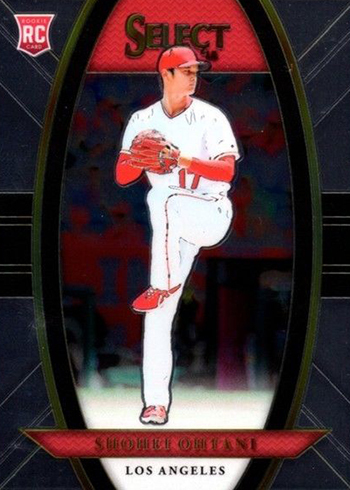 The 2018 Topps Museum Collection Shohei Ohtani Rookie Card has a lot of elegance surrounding it. And while it’s high-end in its construction and the product’s price point, it’s not numbered. 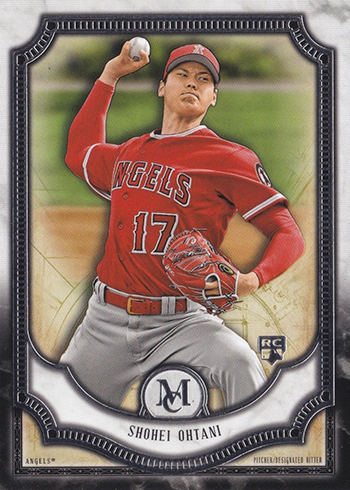 It commands a premium over some of Ohtani’s other Rookies but not with the same ratio of what you’d average spending opening one pack or mini box at a time. The first traditional Shohei Ohtani Rookie Card is likely to end up as one of the most affordable. 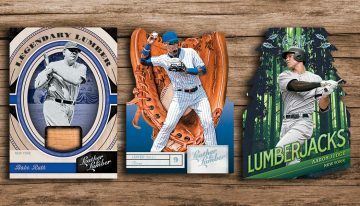 2018 Topps Opening Day Baseball is an entry-level release that comes with cheap packs and a no-frills base set. Usually in the modern era players make their MLB debut before appearing in a MLB base set. This is a notable exception, releasing a few weeks before the start of the 2018 season. 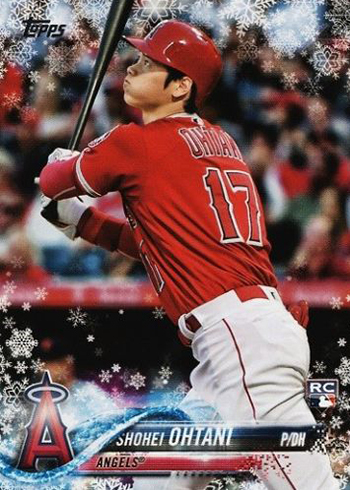 2018 Topps Walmart Holiday Snowflake puts a festive spin on the year’s flagship design, adding snow to the background. Available only at Walmart in special blasters, it’s not a high-end set and it’s not overly rare. However, like a lot of location-specific products, it gives the set a slight boost. 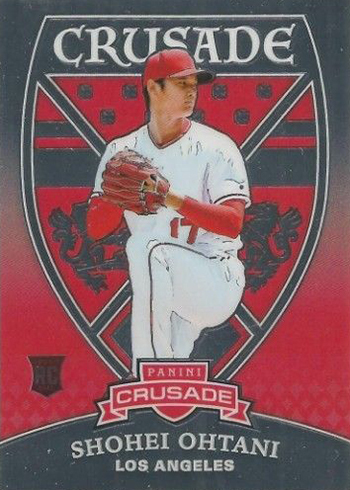 Looking for other early Shohei Ohtani cards? Here’s what came out before and around his MLB debut. This is not a complete list of cards. 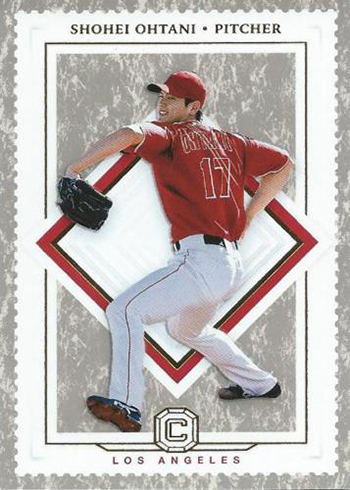 Rather, it’s some of the more popular or notable Shohei Ohtani cards. 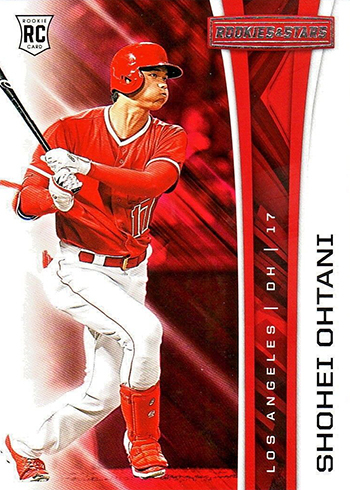 A full Shohei Ohtani checklist can be found in the Beckett Baseball Card Database and Price Guide. 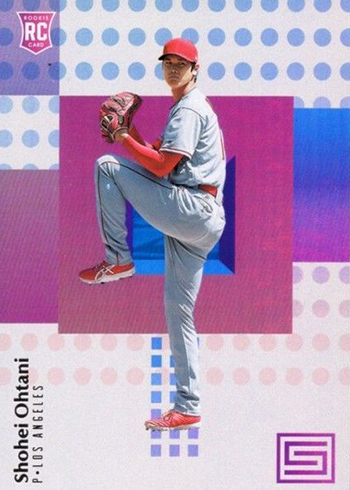 The first American Shohei Ohtani card showed up as something of a surprise. Then it seemed to have disappeared from shelves before reappearing once again. The 2017 Bowman Mega Box Shohei Ohtani (or Otani as the card has him) could only be found in special boxes at Target. 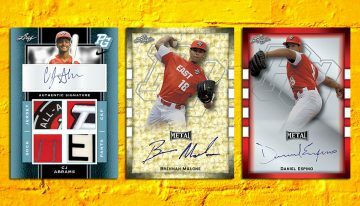 These mixed five regular 2017 Bowman packs with a pair of exclusive Mega Box Chrome packs with their own patterned versions of the Prospect cards. Part of the reason for the surprise was that Ohtani wasn’t among the 2017 Bowman Prospects. He was going to represent Japan at the World Baseball Classic but an injury kept him out of the tournament. A couple of international players did get Bowman cards in the main release. Ohtani was added only to the Bowman Mega Boxes. 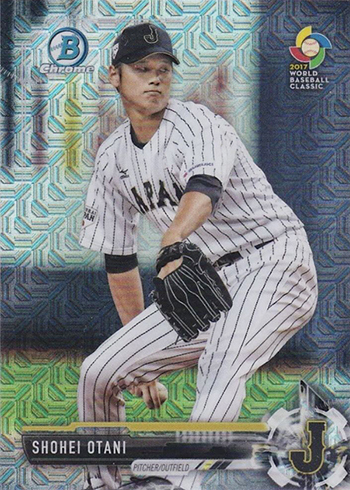 A similar Team Japan card was not in 2017 Bowman Chrome or Bowman Draft. 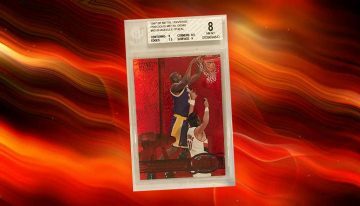 This card has proven to be extremely popular. Not only was it the first to market but the abnormal distribution added to it. Ohtani has international appeal. Japan does have hobby channels, but overseas collectors would have to look to the secondary market to get one of these. Because it’s his first American card, some collectors treat this as a Shohei Ohtani Rookie Card. Others point to other Bowman Prospect cards and how they’re more like inserts. Either way, this has been a popular card since its release. 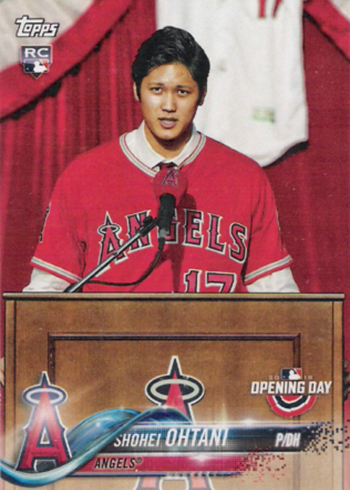 The first Shohei Ohtani card with him in an Angels uniform came as part of the print-on-demand 2017 Topps Now Off-Season set. Originally available on the card maker’s website for 24 hours, only the copies that were ordered were printed. That ended up being 17,323 copies. It set a new record for a Topps Now card. As one can imagine, there’s no shortage of them out there. It has also kept prices in line with what they were originally sold for as singles. Barring huge numbers from Ohtani, this looks to be a card that’s more about history that it is about value. The 2018 Donruss Whammy! 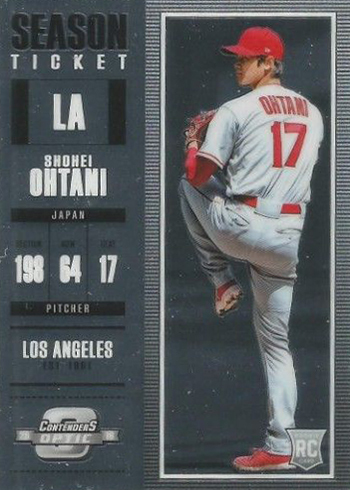 Shohei Ohtani isn’t your usual insert. It’s a throwback to those caricature shirts you’d find in the early ’90s. The illustrations make them unique and the spotted foil backdrop helps put it over the top that much more. Another factor with this particular set is that they’re some of the toughest inserts in the product, adding rarity to the mix. For those looking for a reasonably priced early Shohei Ohtani card, this might be one of the easier options. It’s part of the pre-packaged 2018 Topps Angels Team Set. These come in blister packs and are available at both retail and hobby. Normally at retail, the local teams are most plentiful. But with the interest in Shohei Ohtani cards, it’s possible it could see wider distribution. They’re also available to card shops. 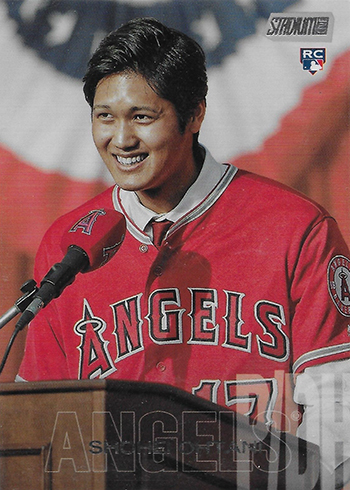 It also offers a glimpse at what the eventual 2018 Topps Shohei Ohtani Rookie Card could look like. The team set cards adopt the flagship design, although the numbering on the back is different and sometimes the photos change. 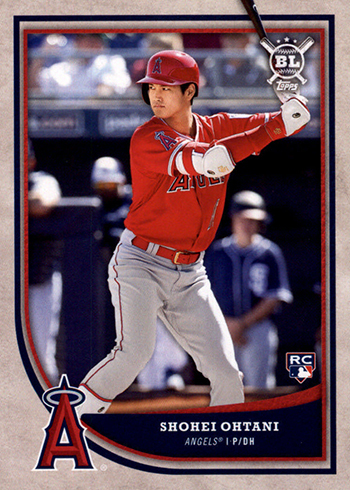 The first traditional, pack-inserted MLB Shohei Ohtani cards are in 2018 Topps Heritage. This card is a variation of the base set, an alternate card of sorts. Part of the Action Image Variation checklist, it’s only available in hobby packs. These aren’t the rarest variations in the product, however they’re still short prints versus regular base cards. 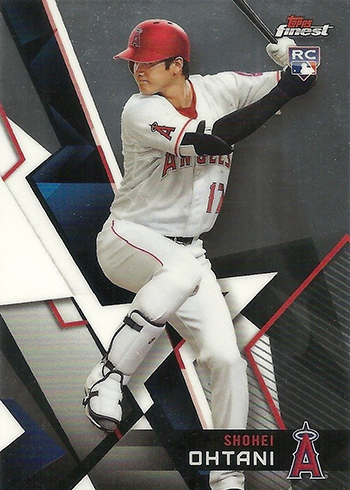 Ohtani is also one of 11 Angels players included on a 2018 Topps Heritage 1969 Poster boxloader. Each poster has 50 copies. Several Shohei Ohtani autographs are on the way. 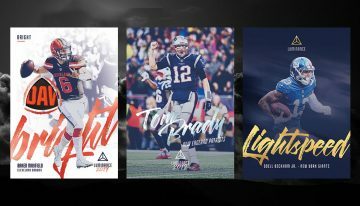 Topps, Panini and Leaf all have him slated for various products releasing in the early part of 2018. The first to arrive is in 2018 Topps Heritage as part of the Real One Autographs set. Signed on-card, it’s based on the 1969 Topps Baseball design. Traditionally, Heritage’s Real One Autographs are popular for big names. Expect this one to take that to an extreme. The combination of Ohtani, his international appeal, Heritage’s built-in and passionate audience and the fact that it’s first should be an early-season perfect storm. 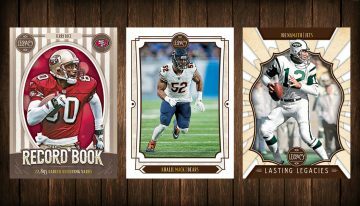 The Topps Living Set is one that’s intended to go on indefinitely. We’re talking years. And a key part of it is that a player only appears once on the checklist unless they change teams. 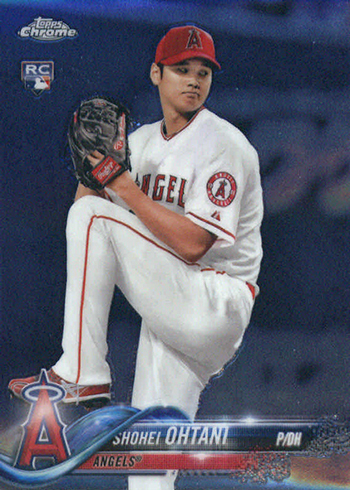 Available through the Topps website, the Topps Living Set Shohei Ohtani came early, in just the third week of the set’s existence. 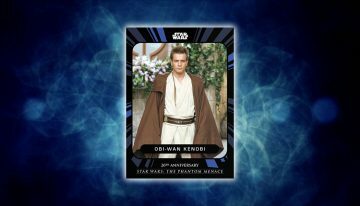 Sold for a week through the Topps website, its production run of 20,966 copies is based on the number ordered. 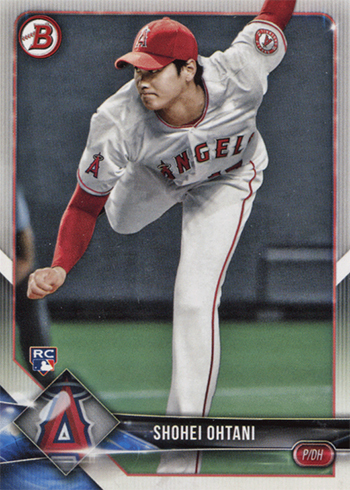 It’s safe to say that there are probably going to be a lot of 2018 Topps Now Shohei Ohtani cards. These capture big moments within hours of them occurring. 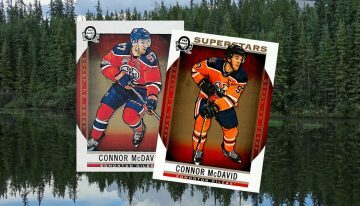 Available on the Topps website for just 24 hours, these are more print-on-demand cards. 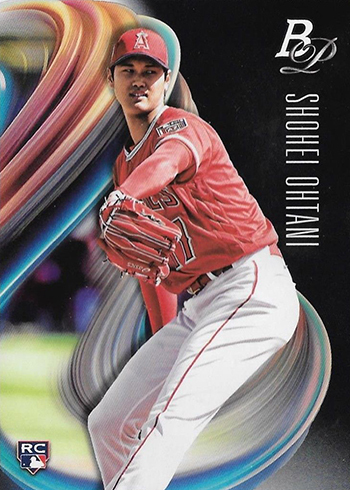 Topps is doing some a little different with Ohtani. The plan is for all of his cards to have both English and Japanese versions. Each much be purchased individually. Ohtani also has autographs in the line as well, the first two of which sold out very quickly. 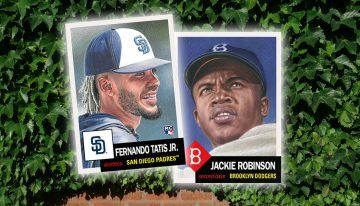 As Spring Training kicked off, Topps released a series of team sets focusing on the earliest parts of the season. 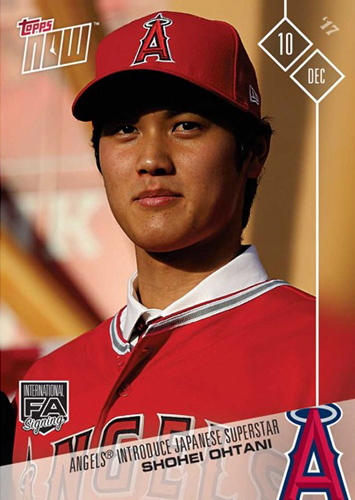 Ohtani appears twice in the Angels team set, one on a solo card and a second alongside Mike Trout. Like other Topps Now sets, these team sets are printed to order after the sales window closes. They’re available on the Topps website for the duration of Spring Training. The Angels also have an upgrade version of the team set that includes an autograph. Ohtani is one of four players available for Los Angeles. 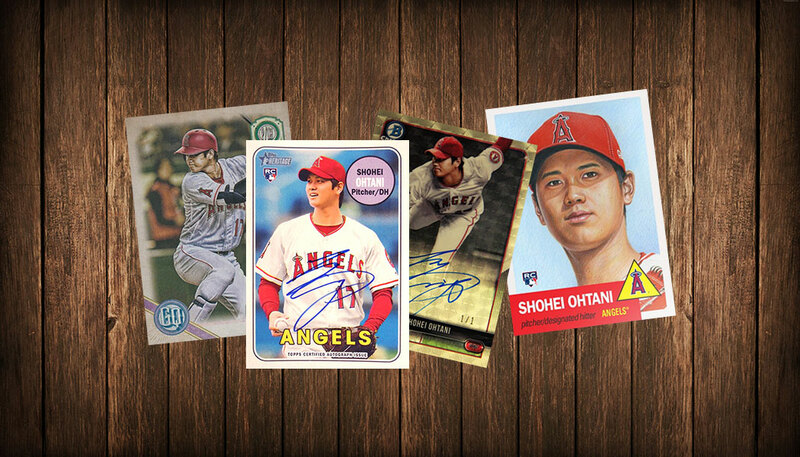 Although there’s no guarantee which signature you’ll get, those that order two Angels autograph sets are guaranteed to get either an Ohtani or a Trout autograph. 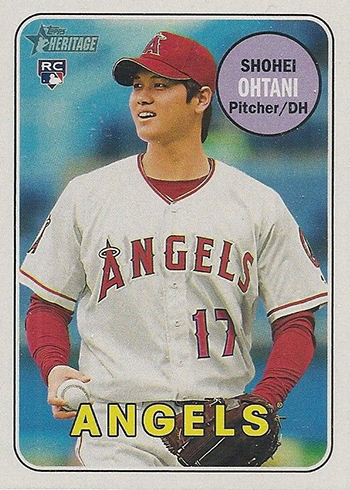 Following his first official MLB pitching appearance in Spring Training, Topps quickly got Ohtani into Topps Now (#ST-4). 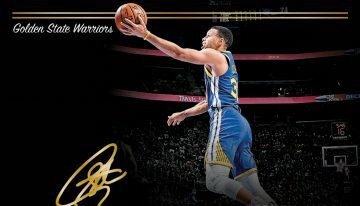 Similar to his signing card, it was available for just 24 hours. While the print run didn’t quite reach the same heights as the first one, it still sold 11,384 copies. This makes it another one of the most ordered Topps Now cards to date. A couple of days later, another card was made for Ohtani’s first Spring Training at bats (#ST-7). It sold 6,842 copies. Why would anyone want a photo-shopped image for a rookie card? The Topps Team Set and Heritage Auto cards are obviously photo-shopped. 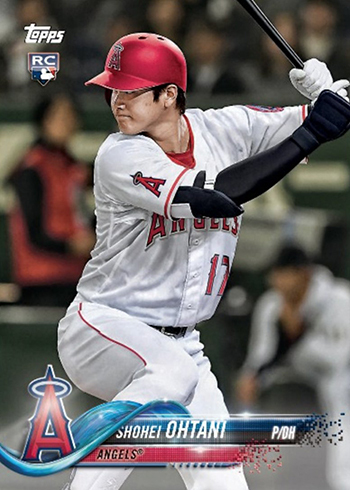 I realize Topps is just giving people what they want, a card of Ohtani in an Angels uniform. 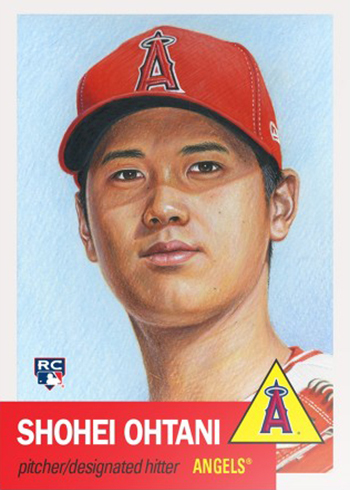 I hate to bring anybody back to reality, but a production card of Ohtani in full uniform is not a real picture, especially one depicting him in a game. I wonder how quickly I could search the internet and find the real image, from a game in Japan, used for the Team Set card. Photo-shopped images are cheap and cheesy. I have considered making a collection of photo-shopped cards, because there are a lot of them. I have never started one, because they are cheap and silly. It took me less than 30 seconds to find the real image. The real image for the Angels Team Set card was featured in a San Francisco Chronicle article. Cheap, just cheap. @”Set Builder” — Air brushing has been used in the hobby for decades. I have been collecting for 55 years, have over 9 million cards, and I believe that air brushing has its place in the hobby yesterday, and still today! This guy is so far a major bust with prices on his cards taking a major dive in the past week. I’m so glad I dumped my one and only short print “rookie” card for a huge sum two weeks ago. Nothing like media hype based on unrealistic expectations. I’ll take my chances on real deals such as Mike Trout and Aaron Judge any day over wild speculation on overhyped “talent,” never mind the fake images and pointless parallels. @chris — Yes, it has been a rough spring. 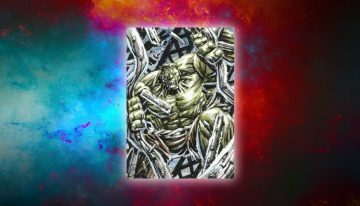 Also contributing — he now has several cards, autographed and otherwise, so the shine of something new is wearing off quickly. Collect what you enjoy and it’s hard to go wrong. At the same time, isn’t writing someone off completely before they’ve had a chance to play an official game kind of the same thing as “media hype based on unrealistic expectations” but on the other extreme? Hope you guys know most, if not all, of the precious Bowman Draft cards are photo-shopped. Major Bust huh? Chris, are you still happy that you dumped that card now? Haha I bet Chris is still glad he dumped his rookie card in early March just because of a poor spring training….. 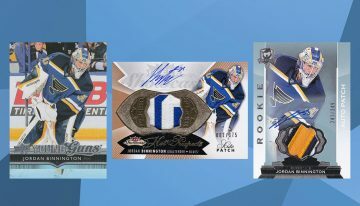 I have another card to add to this list – a parallel from 2018 Topps Opening Day. There are exclusive purple foil parallels at Meijer stores via 3-pack cardboard hangers. Possibly only at Meijer??? I have seen them there (only) for over a month now and 100% there are Ohtani purple foil RC parallels. I have 3 of them and Ebay has been selling them for a while – a few of which have sold between $200-300… I am guessing Topps had to hold back all of the Toys R Us Purples due to the store closings, re-packaged them with new “generic” non-Toys R Us packaging and gave them to Meijer stores. 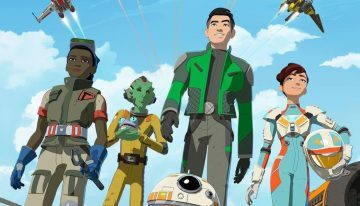 This probably took a few weeks which would explain why they started surfacing roughly a month after Opening Day officially released. I don’t get it !!!!! 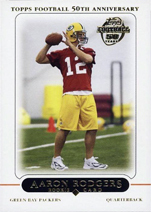 his true rookie card is 2013 I know I have some and they say “Rookie” Just because he is now playing in America does not make him a rookie! If Cristiano Ronaldo started playing in America would that make him a Rookie? Also Leaf and Donruss don’t eaven have MLB license for cards, they get by showing no logos in pictures on card. 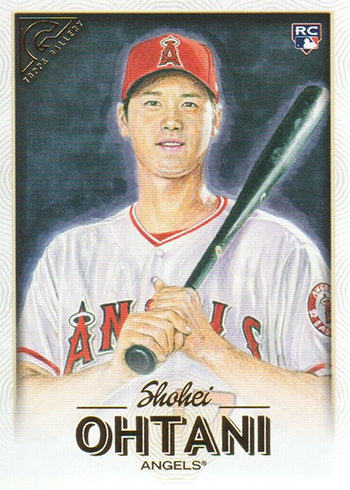 All said 2013 is rookie card harder to come by because they didn’t flood the market, 5000 bowman chrome Shohie Ohtani produced not very rare. @robert — His 2013 cards are from Japan and aren’t generally considered to be Rookie Cards in the MLB sense. That doesn’t discount them in any regard whatsoever, though. It was the same with Ichiro when he came over here. Personally, I tracked down Ichiro’s 1993 BBM card and it’s one of my favorites. If you’re collecting what you love, tags and labels shouldn’t matter much. Nevermind, 2018 Topps Opening Day Purple Foil Parallel Ohtani Rookies currently selling between $200-300 don’t exist. It’s just a rumor, those cards being sold must be photoshopped. @Burt — They do exist. Did some research and they’re three per specially marked blister pack. Not sure if they’re exclusive to anywhere or not. Definitely don’t appear to be that common. I’ve notified the database team. Thanks for the heads up! I stand by my commit earlier ,,,,, Qhtani in 2013 signed a professional contract to play baseball in Japan, till 2018 and comes to America and is now a rookie ? His rookie cards “Japan” are harder to get and a hole lot rarer and still bring a premium prices ! Robert you do realize that he’s not the first player to have played in Japan and then come to the United States to play correct. All other players that have played in different countries and then come to Major League Baseball are considered rookies the president was not set by Shohei Ohtani. @robert Have you ever considered the fact that Steve Young, Jim Kelly, and numerous other former NFL players had rookie cards available when they were in the USFL and then also had rookie cards when they joined the NFL? Not to mention all of the NBA stars like Ricky Rubio, Dirk Nowitzki, and Arvedas Sabonis that previously played in Europe. Different leagues means different rookies for each league. It just makes sense. @mike – What figures are you referring to? This is an article about Shohei Ohtani cards. I have to say this young man is not a bust. I played baseball on a very high level. And his approach to the ball is spot on he see pitches very well almost a comfort zone he has which is hard to teach. If he doesn’t make it as a pitcher he batting will carry him for years to come. DH is in his future. But I would like to see him in a position down the line. Maybe Pujols goes to DH and Ohtani to first.